Two completed pairs of socks in two days! Woohoo! And it was even just chilly enough to wear these today: Grasshopper socks, Blue Moon's new Silkie Socks That Rock, Walking on the Wild Tide colorway. This was the Rockin' Sock Club April kit, in case you have just been rescued from a deserted island and haven't caught up. I love love love love LOVE them, which is ironic considering how much I despise purling, and the entire pattern is p2tog!! They were very comfy today, and stayed up very well. I knit them using an Inox 2.5mm circ, did not do any calf increases and only knit the leg to 4 inches, then did 18 rows of ribbing. I also have lots left over! I started these a while back. The yarn is Jojoland Melody, which I'd been stalking on eBay for quite some time. Having never seen it in person, I wasn't sure about buying it. Then one day at the LYS, I saw it!! It was a titch splitty when I wasn't paying attention, and it does not claim to be superwash. But such a deal at only $7 for a single skein. I think I had about 6-8 yards leftover after finishing these babies. 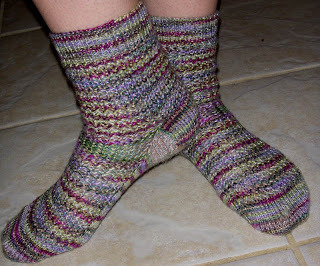 I knit them on an Inox 2.25mm needle, toe up, fly-by-the-seat-of-my-pants style, with a garter stitch short row heel. And now the contest portion of the show! 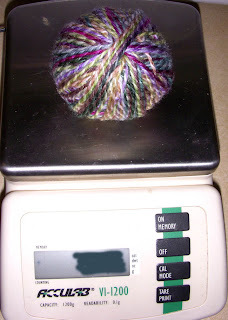 Below is a photo of my ball of leftover Silkie STR, sitting on T's digital scale. Note the weight has conveniently been blacked out. Here's the deal. Leave me a comment with your guess at how much this lovely weighs and the person whose guess comes closest to the actual weight gets it! The weight is in grams, measured to the tenth of a gram. Contest closes Monday night, May 21st at 9pm Eastern. The socks are lovely,I like them shorter! My guess is 42g. Lovely socks! 55g They are very pretty. My guess is 44gm. I've never seen silk sock yarn before! Your socks look nice! Wow... a post AND a contest all in one. I already have that yarn, so I won't be greedy and make a guess. Have fun! Your socks are gorgeous. My guess is 20.4 grams. Don't need the yarn, but wanted you to know that your socks look perfect, and I like the length. They look great! I'm going to weigh in with a guess of 33.4, just for the heck of it. I will guess 34.8g All the socks look great! My guess is 35.9 grams. great looking socks. your socks look great! you have inspired me as i was sitting on the pattern because of the "slouchy " comments! my guess is 48.1g. Wonderful job on the socks and I think you made a good choice in length. I'm going to guess 28.2 gms. My guess is 25.3 and I like the idea of making the grasshoppers shorter so I don't have to worry about them staying up! Lovely Grasshoppers and other socks! I love your socks...Great job! My guess is 22.8 grams.